Cayuga Lake Scenic Byway, Inc.
With coordinates in hand on your Smart Phone, take in the scenic beauty of the Cayuga Lake landscape as you head in anticipation to your first cache on the Cayuga Lake Scenic Byway GeoTrail. Will it introduce you to a quaint lakeside community and its history or pull you in to taste the sweet nectar of the region’s wine country? Whether you’re an avid geocacher or new to this type of outdoor activity, the Cayuga Lake Scenic Byway geocaching trail is the perfect place to plan a geocaching adventure. To enhance the experience of the “Enjoy the Ride” theme of the Cayuga Lake Scenic Byway (CLSB), a GeoTrail is now available along the Byway. The trail is designed to take geocachers to stops around the Cayuga Lake basin to experience the scenic, natural, historic and cultural resources of the area. With support from seasoned geocachers, 20 caches were strategically placed in two regions along the Cayuga Lake Scenic Byway. Each region contains ten caches. With the CLSB GeoTrail Logbook in hand, geocachers are challenged to locate 15 official CLSB caches. Each cache contains a numbered hole punch that corresponds to a numbered space on the punch strip for the region. Once the geocacher has punched 15 spaces they present the punch sheet at one of five official geocoin distribution sites. The first CLSB geocoin commemorates the 10-year anniversary of the Byway. “The colorful coin is sure to become a prized coin and we’re anxious to see how far afield the coins travel in the geocaching world.” said Byway Chair Cathy Millspaugh. 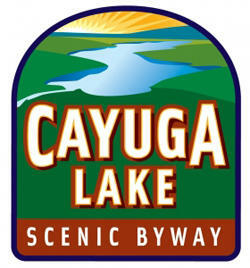 Supported by Geocaching.com (Groundspeak, Inc.), the Cayuga, Seneca and Tompkins counties’ tourism offices and the Towns of Tyre and Ulysses and Village of Interlaken, the Cayuga Lake Scenic Byway, Inc. Board of Directors introduced the trail to expand tourism activities in the Cayuga Lake Region. To learn more about the GeoTrail and what other opportunities the Byway has to offer, visit www.cayugalake.com. Cayuga Lake is one of the 11 Finger Lakes located in the heart of central upstate New York. The Finger Lakes Region offers four seasons of breathtaking beauty, rich history, award-winning wines and exceptional cuisine featuring locally-grown and produced foods. As you take your colorful Cayuga Lake Scenic Byway geocoin in hand and head home after 2 full days of exploring the Cayuga Lake area with the rolling hills and steep shale cliffs etched in your memory, you find yourself already planning a trip back to enjoy more of the ride and landscape of the area!